Aware of the suffering caused by the destruction of life, I am committed to cultivating the insight of interbeing and compassion and to learning ways to protect the lives of people, animals, plants, and minerals. I am determined not to kill, not to let others kill, and not to support any act of killing in the world, in my thinking, or in my way of life. Seeing that harmful actions arise from anger, fear, greed, and intolerance, which in turn come from dualistic and discriminative thinking, I will cultivate openness, nondiscrimination, and nonattachment to views in order to transform violence, fanaticism, and dogmatism in myself and in the world. Aware of the suffering caused by exploitation, social injustice, stealing, and oppression, I am committed to practicing generosity in my thinking, speaking, and acting. I am determined not to steal and not to possess anything that should belong to others; and I will share my time, energy, and material resources with those who are in need. I will practice looking deeply to see that the happiness and suffering of others are not separate from my own happiness and suffering; that true happiness is not possible without understanding and compassion; and that running after wealth, fame, power, and sensual pleasures can bring much suffering and despair. I am aware that happiness depends on my mental attitude and not on external conditions, and that I can live happily in the present moment simply by remembering that I already have more than enough conditions to be happy. I am committed to practicing right livelihood so that I can help reduce the suffering of living beings on earth and reverse the process of global warming. Aware of the suffering caused by sexual misconduct, I am committed to cultivating responsibility and learning ways to protect the safety and integrity of individuals, couples, families, and society. Knowing that sexual desire is not love, and that sexual activity motivated by craving always harms myself as well as others, I am determined not to engage in sexual relations without true love and a deep, long-term commitment made known to my family and friends. I will do everything in my power to protect children from sexual abuse and to prevent couples and families from being broken by sexual misconduct. Seeing that body and mind are one, I am committed to learning appropriate ways to take care of my sexual energy and to cultivating loving-kindness, compassion, joy, and inclusiveness—which are the four basic elements of true love—for my greater happiness and the greater happiness of others. Practicing true love, we know that we will continue beautifully into the future. Aware of the suffering caused by unmindful speech and the inability to listen to others, I am committed to cultivating loving speech and compassionate listening in order to relieve suffering and to promote reconciliation and peace in myself and among other people, ethnic and religious groups, and nations. Knowing that words can create happiness or suffering, I am committed to speaking truthfully, using words that inspire confidence, joy, and hope. When anger is becoming manifest in me, I am determined not to speak. I will practice mindful breathing and walking in order to recognize and to look deeply into my anger. I know that the roots of anger can be found in my wrong perceptions and lack of understanding of the suffering in myself and in the other person. I will speak and listen in a way that can help myself and the other person transform suffering and see the way out of difficult situations. I am determined not to spread news that I do not know to be certain and not to utter words that can cause division or discord. I will practice right diligence to nourish my capacity for understanding, love, joy, and inclusiveness, and gradually transform the anger, violence, and fear that lie deep in my consciousness. Aware of the suffering caused by unmindful consumption, I am committed to cultivating good health, both physical and mental, for myself, my family, and my society by practicing mindful eating, drinking, and consuming. I will practice looking deeply into how I consume the four kinds of nutriments—namely, edible foods, sense impressions, volition, and consciousness. I am determined not to gamble or to use alcohol, drugs, or any other products that contain toxins, such as certain Web sites, electronic games, TV programs, films, magazines, books, and conversations. I will practice coming back to the present moment to be in touch with the refreshing, healing, and nourishing elements in me and around me, not letting regrets and sorrow drag me back into the past or letting anxieties, fears, or cravings pull me out of the present moment. I am determined not to try to cover up loneliness, anxiety, or other suffering by losing myself in consumption. I will contemplate interbeing and consume in a way that preserves peace, joy, and well-being in my body and consciousness, and in the collective body and consciousness of my family, my society, and the earth. For a full commentary on the Five Mindfulness Trainings, see For a Future to Be Possible, by Thich Nhat Hanh. Practice eating mindfully with these tools. View the written Seven Practices of a Mindful Eater in the pdf below and enjoy this video, in which Dr. Lilian Cheung explains the practices. Guidelines for the Savor & Share Recipe Contest - October 2010. Our wonderful recipe contest partners are outlined here. These healthy food experts have much to offer anyone looking for ways to savor delicious dishes that nourish the body. Start the New Year off with mindfulness. Make a serious pledge to yourself. Begin writing a Mindful New Year’s Resolution. This resolution is a promise to yourself, and putting it in writing will help you see clearly what you intend to achieve in the coming months. People who make resolutions are likely to be more successful in changing their behavior than people who do not. Breathing out, I release and let go of all that which is not helping me toward wellness. Breathing in, I see wellness in me. Breathing out, I am determined to change for the better with mindful thoughts and actions. Print the attached certificate and fill in your name and resolution. Choose a special place to post your certificate, a spot where you will see it often, or where you need the most prompting to remain mindful—say, next to your desk, at the computer, beside your bed, or on the fridge. 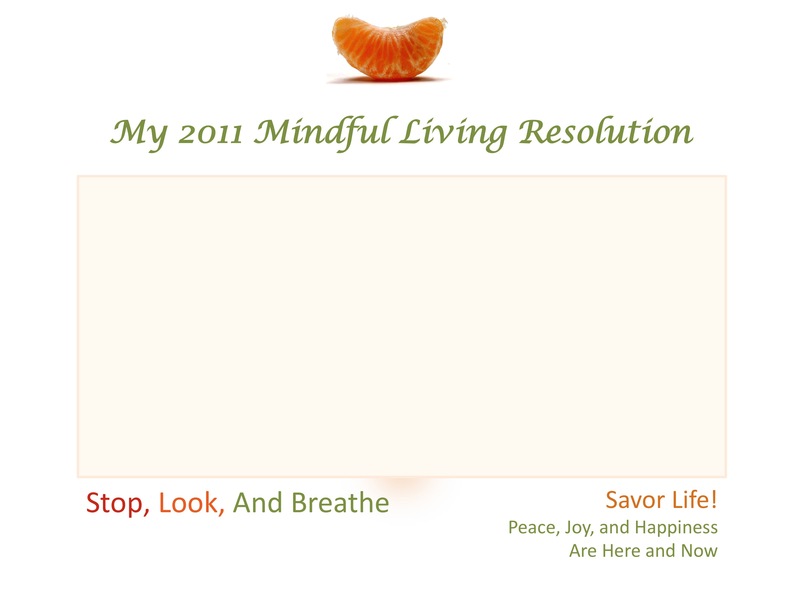 Share your resolution and browse those of other Savor Sangha members on the Mindful Resolution Wall. This movement comes from the traditional Chinese chi qong practice. It is both releasing and invigorating. It can be done wherever you are. It does not require any equipment; your own body is the instrument. It is convenient, since you can do it anywhere, at any time, and it takes only five minutes. Stand with your feet at shoulder width; relax the body with the knees slightly bent. Have your eyes focused on an object or scenery in front of you. Swing your arms up straight in front of you toward the sky or ceiling, as you inhale deeply. Drop and swing your arms back down all the way and behind you, as you exhale completely. Repeat this up-and-down movement continually. Increase the speed of the up-and-down movement gradually throughout the exercise for five minutes. When doing this exercise, try to feel that you are “swimming” in air. You are one with the air, and you exchange energy with the air. When you move the arms up and inhale, you are taking in fresh energy from all that is around you, and when you swing your arms down on the exhale, you expel all the burdensome energy. Every move is a mindful move, and every move is actively engaging with the air and your breath. You will instantly feel different after doing the arm swing for five minutes continually. Your heart is pumping, and you feel happier. The tension in your head and around your shoulders and back muscles start to release and relax. The movement together with the breathing will take you back to yourself, uniting body and mind. If you have back problems or other physical concerns, please consult your health-care provider before starting this exercise. This excerpt can be found in SAVOR, on page 175.